November 2017’s Honors Student of the Month is Luke Hoheisel! Luke, a Senior English major with a Digital Studies minor, joined the Honors College as a transfer student in the Fall of 2016. 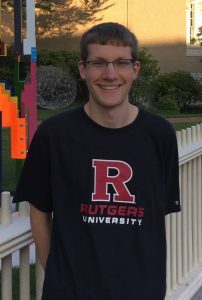 In Luke’s short career at Rutgers-Camden he has participated in many enriching experiences, including a Learning Abroad trip to Germany and an independent study in digital publishing with the Encyclopedia of Greater Philadelphia. As the Fall semester winds down and Spring 2018, his final undergraduate semester, approaches, we interviewed Luke to reflect on his experiences in college. HC: What is the best piece of advice you’ve been given, and as a follow-up, what advice do you have for other students? LH: The best piece of advice I’ve received was “don’t let the urgent crowd out the important.” As for advice to other students, I would simply encourage them to explore – explore totally new subjects and courses, explore every corner of campus, explore the city, even explore another country! LH: It’s provided a terrific array of experiences and opportunities. I’ve made great friends here by finding clubs and activities that sounded engaging and interesting, or just showing up to an event on a whim. LH: There have been many excellent moments, but one that stands out is the Digital Language Art class trip to the Philadelphia Museum of Art. It had a little bit of everything that exemplifies the Rutgers experience in my mind: exploring places both new and familiar, learning a lot, and having a great time with friends. LH: I’d like to do professional writing and/or video work for a nonprofit or educational organization, while also leaving time for creative writing (fiction/scriptwriting) on the side. Page last updated by The Honors College at 4:17 pm January 25, 2018 . This page was printed from http://honors.camden.rutgers.edu/hc-student-of-the-month-archives/november-2017/ at 8:45 AM Wednesday, April 24, 2019.